The purpose of the Pupil Premium is to help students from low income families who are eligible for free school meals (or have been in the last 6 years), looked after children and those from families with parents in the armed forces. In particular, the main aim of the Pupil Premium is to raise the achievement of these students and to close the attainment gap between these students and those not entitled to Pupil Premium support. Nationally, these students achieve at a level significantly below those not entitled and in secondary education the national trend is that the achievement gap widens even further. How much Pupil Premium money does The Academy, Selsey receive? In 2017-18 The Academy will receive about £130,050 additional funding to support disadvantaged students. The Pupil Premium makes additional intervention programmes possible for students who do not make enough progress. Intervention programmes are based around in class, small group or one to one support, not just focusing on core academic skills, but also pastoral or attendance support. Part of the money is spent on extra staffing so that class sizes are smaller. Funding also goes towards running of our Breakfast club and our accelerated reading programme. We also allocate part of the funding to provide students with enrichment activities, such as trips and visits. The decision on how the funding is spent is based on research which shows, which strategies work best and are most likely to have the greatest impact. How will parents know how the money is spent? The progress of all students is tracked by throughout the year and the 6 assessment points quickly allow us to check what impact interventions are making. Our progress leaders for lower and upper school will identify students requiring intervention and coordinate the response. If a student takes place in an intervention programme we track the impact throughout to measure improvement. 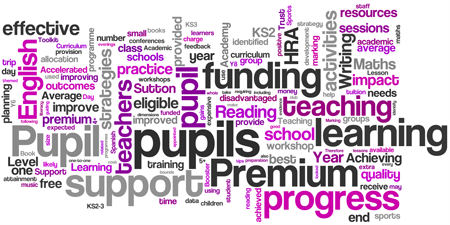 To read how our Pupil Premium Budget was spent during 2017/18 and what impact it has had please click here. For more information please contact Mr Savage for Y7 and Y8 and Mr Tymon for years 9 to 11. If you are not sure whether your child is eligible for Free School Meals or would like more information about how you should go about claiming an entitlement, please contact School Reception, in confidence.